As you might know 113 Norwegians got the surname Grimsby. Over the pond in the US you will find even more named «Grimsby» due to all the immigrants from Norway between 1860 and 1920. Grimsby is also a much used name for places as we will look at here. A tiny isley of Tananger nearby Stavanger where lobster fishermen in the old days could put their boats and sleep in small cabins. Several piles have been erected on the island. The fishermen named it such as all the boats made it looked just like in Grimsby at a busy day. At Karmøy south of Haugesund you’ll find Åkrehamn that got a little place named Grimsby nearby the center. Should you move here you could buy an apartment in the «Grimsbytunet» complex. A cluster of modern townhouses. Åkrehamn are known for all their fishermen and quite rightly the place got it name after all the shipping towards England. A small neighborhood with its own bus stop. There will be a sign with «Grimsby» if you are driving trough Vanse in Farsund. Of all the persons in Norway named Grimsby the most of them got their roots from here. You can easily find the name back to the 1600’s. A long and narrow road in the outskirts of Tromsø. Grimsby and Tromsø became twin cities in 1961, but the partnership has ended. I once spoke to a Grimbarian that meant the twinning came due to the large ship traffic between the towns. Apart from fish they also cargoed ice from Tromsø that was used for storing of fish in Grimsby. At the picture we see the 26 year old «Grimsby kindergarden» located near Marker. A small urban area in Marker with some farmyard in scenic surroundings has earned the Grimsby name. A family here named Grimsby ran the famous «Grimsby farm» in Rødenes. Grimsby is thus widely used. 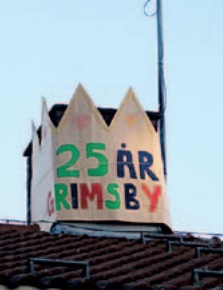 Just look at the picture above of the chimney in Grimsby kindergarden for their anniversary. However there are also other norse spellings like Grimsbø, Grimsbøen and Grimsbu that all should have the same meaning. Kuslepp på Grimsbø i Jølster from anne viken on Vimeo. In beautiful Jølster in Sogn og Fjordane we find Grimsbø. Look at the video above. Double Olympic gold medalist in handball, Kari Aalvik Grimsbø, is very famous in Norway at least. 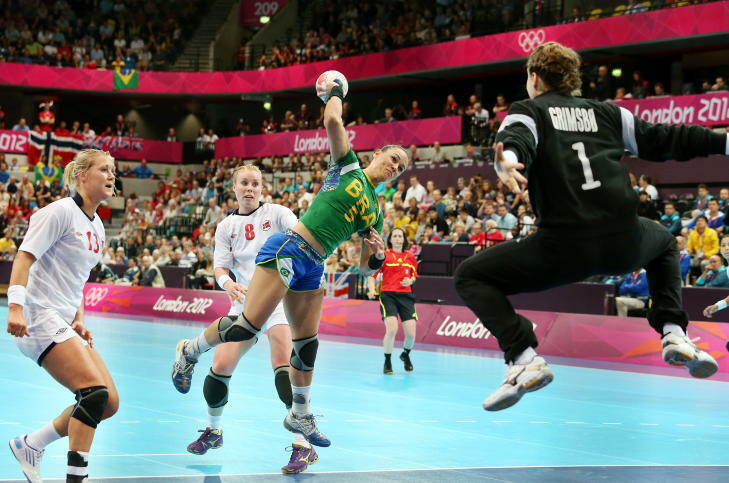 Look at the letters at the goalies back from the picture of the London 2012 Olympics! You should neither forget Grimsbu that is placed at the foot of Norwegian massive mountains Dovre and Rondane. Here it’s well worth a stay at the Grimsbu Tourism Center that is a motel and camp area. 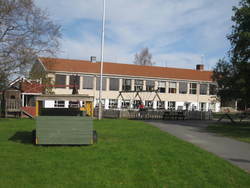 Or perhaps take a visit to the Grimsbu Beerfestival in June every year. Say «skål» with the locals and enjoy the live music. On celebrities named Grimsby we find Eli Grimsby (former Olympic director of Oslo 2022), Ola and Martin Grimsby (cup finalists for Gjøvik Lyn in 1914. Ola also had the record for the longest ski jump in Holmenkollen), Eivind Grimsby Harr (former TV presenter at the national broadcaster NRK) and Tarjei Grimsby (jazz musician). Whether we once will get at Norwegian with Grimsby at the back of a Grimsby kit is unknown. At the Norwegian FA we found two players that both played in the Norwegian 5.th division – Andre Grimsby (Farsund) and Thomas Arne Grimsby (Pol of Stavanger). In England they believe at the legend about the Dane fisherman (Viking) Grimr, but in Denmark no one got the surname Grimsby, neither you’ll find any places named Grimsby. The closest we got were two streets named «Grimsbyvejen» in both Esbjerg and Ølstykke. My surname Grimsby can be traced directly to a Gilbert Grimsby 1545 who was my 13th Great Grandfather. The name appears in and around Lincolnshire England many times as De Grimsby cases of Simon De Grimsby appear in the 1300’s and before. I have a posted DNA that I would like to check with DNA results of Norwegian DNA.